Keep warm and find your way in the dark with this knitted beanie with integrated LED light. USB rech.. The Promier Led Flashlight Screwdriver has an 8 in1 screwdriver for all your handiwork needs. It con.. 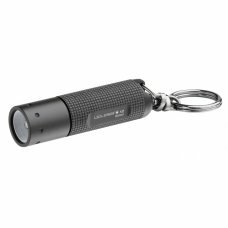 The K2 delivers a very bright 25 lumens with a 20m range in a keyring light that measures under 52mm..
Astounding performance for its size. Weighing a mere 34 grams and measuring less than 7cm, this torc..
A great everyday headlamp that is affordable and efficient. The MH2 offers good performance at a gre.. The MH6 may only weigh 93 grams, but there is nothing lightweight about it's performance. With 200 l.. This torch might be tiny but it's performance is anything but! With an output of 1000 lumens, the MT.. The P14.2 incorporates Ledlenser's latest technological advances in a torch that is now brighter and.. The P3 produces a bright beam for great lighting of short distances and small areas. The P3's .. The perfect torch for engineers and technicians. No matter whether you are inspecting the undercarri.. The traditional size and shape of a handheld torch, now with 50% more light than its predecessor and..